Introduction: Making our list, reviewing it twice, what a luxury to have Casey encourage our fishing tackle vice. Time to round out and finish up our gift buying recommendations for 2011 and just in time for black Friday. Think you�re finished with your list? You might want to look again as we�ve saved the best for last. Amazon Hardbait (KLures Peacock Ripper) : In a specialty category that threatens to become an annual event, there is nothing more heart pounding or thrilling in our experience than a monstrous strike of a crazed peacock bass annihilating your topwater plug. Last year�s bait of choice was the Luhr Jensen Wood Chopper (link), but this year, we discovered what the KLures Peacock Ripper was all about. Is angler on your list aspiring to head to the Amazon to fish for Peacock bass? Better get them some chopper baits from KLures! A little lighter and easier pulling than the Luhr Jensen, these individually hand made and painted baits let you fish hard over a longer period of time increasing your chances to experience that sensory overloading strike of a lifetime. 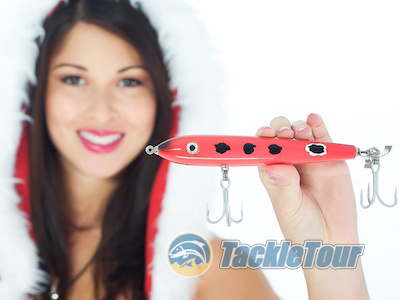 The best place to get these well built lures is direct from KLures. Is it a swimbait or a crankbait? A waker or sub surface swimmer? We're not quite sure but so far, so good! Freshwater Hardbait (Lucky Craft SKT Fat Smasher) : If you or the angler on your list ever needed evidence that the swimbait craze has overtaken the industry, you need look no further than one of Lucky Craft USA�s introductions this past year at ICAST. The SKT Fat Smasher is a hybrid crank/swimbait featuring a three-piece swimbait like body, in a compact, crankbait sized shape. You can fish it in a variety of styles but it�s designed to trigger strikes in the toughest conditions when nothing else is really working. We�ve yet to test the Smasher, but we�re intrigued enough to make it part of our 2011 Holiday Gift Guide. The Fat Smasher is available in a wide range of patterns at Tackle Warehouse. Hand tied jigs with Mustad hooks for less than $2.75.. that's just not fair. Freshwater Skirted Bait (Bass Patrol Jigs) : There is no more universal a bait than a �jig�. 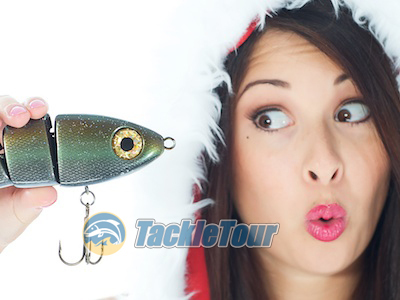 Pick a species of fish that anglers pursue, and you�re likely to find a jig custom tailored for tempting that species. The list of jig manufacturers making product in the pursuit of largemouth, smallmouth, spotted and any other variety of bass is endless so what do we look for in a jig? 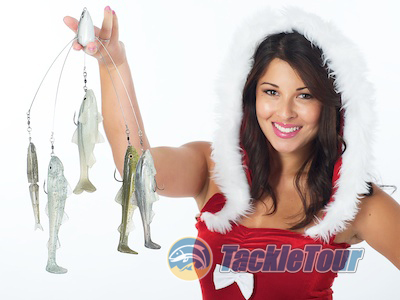 How about hand tied skirts, an intriguing head design, and quality hooks all at a price that won�t break the bank? Throw all those qualifications into your tackle bag, shake that bag around, reach in, and we bet you�ll pull out a jig by Bass Patrol. If not, then you�d do well to check them out. These jigs are tough to beat at about any price, but in today�s economy, at $1.99 for their jigs made of living rubber and $2.49 for their jigs made with silicone skirts, they�re a no brainer and make a great stocking stuffer for that angler on your list. The Living Rubber and Silicone versions are both available at Hi's Tackle Box. Freshwater Softbait (Jackall Super Crosstail Shad) : We are still logging more time testing the Super Crosstail Shad but it has already accounted for quite a few fish and is especially effective in cooler weather when the bite can be tough as well as deep clear water where the fish are extremely line shy and a little extra finesse is required. If your a drop shot fan this bait ups the ante in realism with the same quivering tail design as the original. Jackall offers the bait in wide array of patterns and the various shad patterns are especially detailed. The lures come eight to a pack and are available at Tackle Warehouse for just under 10 dollars. Soft Swimbait (Osprey Randy McAbee rMac) : Osprey continues to offer a complete range of swimbaits which perform very well in a wide range of conditions and don't cost anglers a fortune to fish. Professional Angler Randy McAbee has partnered with Osprey to create a new swimbait that us tuned to draw more strikes. The "rMac" is slightly smaller than the standard sized Osprey's at 6 inches and features a slightly thinner profile with the same tail so it can be effectively fished slower, staying in the strike zone longer to entice everything from smaller males to big lunkers. The bait comes armed with a top hook and a belly eye for affixing an additional treble hook. The rMac is available in just about all the popular Osprey patterns and is available now at Tackle Warehouse for $19.99 each. 22nd Century Swimbait's "Stubby" comes with big eyes! Hard Bodied Swimbait (TripleTrout Stubby) : Soft bodied swimbaits may be all the craze, but Cal still prefers tossing the hard bodied baits. Naturally, among his favorites are the baits made by 22nd Century Swimbaits and the famed TripleTrouts, but it�s been a very long time since anything new from this camp emerged. The TripleTrout Stubby has been a �secret� bait for several years and is hardly something new to those in the know, but for the every day angler they might be just that. Built a bit wider, and certainly more stout than the original TripleTrout, the Stubby features the same three-piece construction and enticing, fish catching action. The Stubby is available now at Tackle Warehouse. Overall, it's larger and more stout than the original TripleTrout. Specialty Item (Jerry Rago's Bait Ball) : Want to get that angler on your list the hottest thing going? The Alabama Rig, also known as an umbrella or spreader rig, is on fire thanks to some recent tournament wins but the actual rigs are increasingly difficult to find. Thanks to Jerry Rago, folks out on the West Coast now have their own home-built version of the rig and if you act quickly, you can get it now at Hi's Tackle Box! Jerry Rago's Bait Ball is the latest "Alabama Rig" to hit the market. The difference here? This contraption is still available (if you act quickly!). Enthusiast Lure: Megabass Vision 110 Magnum & Evergreen Shower Blows: The hits keep coming with Megabass and the Vision 110 variants. The 110 Magnum introduced earlier this year is a bigger, heavier version of the original that feels a lot more like a Lucky Craft Pointer 100. It casts just about as well and has a similar resistance in the water when working the lure back to your position. Megabass baits are addicting and the Vision 110 Magnum is no exception. The new, larger 110 also comes more US Market friendly colors and makes for a great stocking stuffer. The Megabass Vision 110 Magnum is available in a complete spectrum of patterns at Tackle Warehouse. If you can find them, Evergreen's Shower Blows is a great topwater bait. Evergreen�s Shower Blows makes it into our Holiday Gift Guide two years running and it remains one of our favorite topwater baits from overseas. Its combination of castability and the ease with which to work it make it a deadly combination to anyone who is a fan of topwater pencil popper type baits. Only difficulty here is where to find this gem.